In August, 1993, Delxino and Deborah Wilson de Briano were a young, Black couple, struggling financially in Atlanta, Georgia. A friend introduced them to a very successful man who invited them to join his network marketing business opportunity. They joined his local "Atlanta Group" and started attending his training meetings and presentations several nights per week after work, and on Saturdays. They became committed students and learned all they could from him. Delxino and Debbie were two of only a few Blacks participating in the predominantly white business opportunity. Delxino, Debbie and their team continued to work hard, through the year. In August, after a year of hard work and some small success, Delxino and Debbie realized that they would have to create an environment which catered to Black people, if Blacks were going to truly succeed in the business opportunity. They realized that Black people have a different culture, background, and way of communicating than the way they were trained. They realized that they needed their own identity and a new marketing strategy. Since Black people worked better together as a team, they needed a TEAM marketing strategy. In August of 1994, TAG TEAM Marketing was founded. TAG TEAM stood for "The Atlanta Group - Together Everyone Achieves More". Delxino and Debbie had a big vision for their organization. They loved their people and intended to make the team successful at all costs. With a hard-core work-ethic, a fun, Black family atmosphere, and a high-energy training system, the team of brothers and sisters went to work. TAG TEAM Marketing added their ethnic flavor to all aspects of the business opportunity, and soon were on their way to building a hugely successful team. They began a mission to create prosperity, love, unity and 1,000 Black millionaires. The word spread all over the Southern United States that "brothers and sisters are working together in Atlanta, making lots of money and making history!" By the end of 1994, TAG TEAM Marketing had grown from less than 40 people to well over 5000 members. The founder of TAG TEAM Marketing, Delxino Wilson de Briano, became the number one producer in the network marketing company at age 25, and received the distinguished "Person of the Year" award for year of 1994. TAG TEAM Marketing was the number one producing team in the world, for the entire year. By 1995, the word about TAG TEAM Marketing was spreading from the Southern U.S. to other parts of the country. New TAG TEAM leaders began developing and undertaking the mission, and spreading the vision of TAG TEAM Marketing all over the United States. TAG TEAM Marketing spread to the East Coast of the U.S. where major expansions took place. Many TAG TEAM members became wealthy in both the Southern and the Eastern U.S.
By the end of 1995, TAG TEAM Marketing had firmly established itself as a formidable entity in the network marketing industry, and grew to over 40,000 members. TAG TEAM members received the majority of the top production awards for the year. Delxino Wilson de Briano received the Number One Overall Producer award for the year. TAG TEAM Marketing was again the number one producing team in the entire company for the year. In 1996, the growth and development continued as brothers and sisters in different U.S. states joined TAG TEAM Marketing. Major expansions began in cities all over the United States. New leaders spread the vision of TAG TEAM Marketing from the East coast to the West coast. Delxino and Debbie Wilson de Briano personally led an expansion in the state of California and refined and developed their TAG TEAM Training System considerably during this period, in order to handle the growing demand for solid TAG TEAM leadership, training and support. By the end of 1996, TAG TEAM Marketing was generating 9.5 million dollars per month in billing and had grown to almost 90,000 members. At the end of the year, almost every national award went to TAG TEAM Marketing members, including 9 out 10 of the "Top Money Earners for the Year". Delxino Wilson de Briano was awarded the Number One Producer Awards for the third straight year, and given the top profit sharing check in the network marketing company. 1997 was a year of great achievement for TAG TEAM Marketing. Membership continued to grow and expand and so did the reach of the team. The business opportunity expanded to Canada, and new Canadian members joined TAG TEAM. TAG TEAM Marketing Founder, Delxino Wilson de Briano, decided to take a very direct role in the leadership and training of the now huge international team. He sponsored two FREE leadership training conventions for TAG TEAM members during this year. The admission requirements were simple: you had to make at least 25 sales to get in, or 50 to get preferred seating. Over 5,000 TAG TEAM members got qualified to attend these two events, creating one of the biggest sales surges in the history of TAG TEAM Marketing. TAG TEAM Marketing produced it's first video tapes this year, including the classic "Atlanta Promo Video" and the all time classic "Follow Me". In October of 1997, TAG TEAM held a historical national convention that brought thousands to experience TAG TEAM Marketing. The top TAG TEAM leaders at the time, trained everyone on TAG TEAM business skills. Rap artist KRS-One and Doug E. Fresh held a private concert for everyone who attended the convention. A documentary video of the weekend was produced and released as TAG TEAM Marketing's Classic "Video Newsletter Volume 1". In 1998, new leaders emerged and spread the vision of TAG TEAM Marketing. Members joined the team daily in the United States and members started building consistently in Canada. The team made a fantastic amount of sales. TAG TEAM Marketing held two national conventions in 1998. One in San Diego, California and one in Secaucus, New Jersey. Both of these events took the organization to a new level. Many city leaders graduated to national leadership. New TAG TEAM classic promotional videos were released as well. TAG TEAM's top producers were awarded with tickets to exclusive educational and motivational events. A tightly organized international structure was implemented in TAG TEAM Marketing. Members started working with other members from different parts of the US & Canada on a daily basis. The result was incredible production, great incomes, victory and morale. In 1999, TAG TEAM Marketing continued in its fine tradition of productivity and expansion. New members joined TAG TEAM Marketing all over the world. With the opening of the business opportunity in United Kingdom and other parts of Europe, TAG TEAM Marketing recruited and met its first Black European members. Love, unity, productivity and the vision of TAG TEAM continued to spread like wildfire. More and more brothers and sisters were introduced to TAG TEAM Marketing's beauty and awesome power. TAG TEAM Marketing expanded its horizons, started conducting charitable projects and sponsored social events in different parts of the country. TAG TEAM Vice President Deborah Wilson de Briano started a Black women's organization called the P.O.W.E.R. Circle (Positive Outstanding Women Elevating To Riches). The organization is committed to helping Black women in TAG TEAM Marketing to achieve greatness in all areas of their lives. The organization helped the women in TAG TEAM to unify and begin dominating production in the team. TAG TEAM hosted a series of major regional training events, and crowned new top producers in the U.S. and Canada. New leaders emerged to lead city teams to success. The classic TAG TEAM video Let's Do It Again	and audio tape "Countdown to Year 2000" were released this year as well. Towards the end of the year, the West Coast experienced a big boom in productivity, with lots of new members joining TAG TEAM Marketing, selling the products and services and setting out to make their dreams come true. By the end of the year, TAG TEAM Marketing was again the number one producing team in the network marketing company. Many TAG TEAM members took the top awards for the year. Delxino Wilson de Briano was awarded number one producer awards for every quarter of the year 1999. In the year 2000, TAG TEAM made history with the launch of this website www.tagteammarketing.com. Before the website even launched, there were thousands of visitors to TAG TEAM's 'Under Construction' web page. When the website finally launched on January 5, 2000, it was greeted with rave reviews. TAG TEAM Marketing also introduced the TAG TEAM News website called the "Daily 411", which is a website for both current and past TAG TEAM Marketing news. Furthermore, TAG TEAM introduced the Underground Forum, an Internet based communications system for TAG TEAM members and Black people everywhere. In the year 2000, this website received approximately 400,000 hits per month. The message of TAG TEAM Marketing reached over 20 countries through the Internet. Hundreds of e-mail messages poured in commending TAG TEAM Marketing for its efforts and expressing interest in its programs. The TAG TEAM website was also featured on several other websites and was even shown in a news broadcast. TAG TEAM Marketing also made an investment in the Black Internet, purchasing over 400 positive Black website domain names for future development. By mid year, TAG TEAM published another website www.tagteamconvention.com and in August, held an international convention in Norfolk, Virginia. Months later, the official TAG TEAM Store website (www.tagteamstore.com) was published, making TAG TEAM merchandise, accessories, videotapes and printed items available for ordering over the Internet. TAG TEAM members continued to spread the vision of TAG TEAM Marketing aggressively, all over the world. Members continued to sell telecommunications services and generate impressive revenues. Many regional training events were held, delivering the now legendary TAG TEAM Marketing Training System. 2001 was a year of new direction for TAG TEAM. After 7 years in association with the network marketing company, TAG TEAM Marketing began a new direction with a core team of committed members. TAG TEAM started hosting Black Business Seminars in order to take their knowledge of wealth and business building directly to the Black community. The same training material that was once restricted to top producing TAG TEAM members only, was being made available to the public for the first time. TAG TEAM members began selling tickets to the seminars and earning commissions from their sales. TAG TEAM Marketing held a series of Black Business Seminars in Los Angeles, California, New York City, Washington, DC and College Park, Maryland. Each of the events were phenomenal successes. TAG TEAM Marketing Founder Delxino Wilson de Briano taught each of the seminars and passed on the techniques that made himself and Debbie millionaires by the time he was 26 years old. The first series of events, entitled "Black Business Basics", taught key skills necessary to start, maintain and improve a Black business. The second series of events, entitled "The Leader In You" taught how to successfully lead a team in business and in life. People traveled from all over the United States and Canada to learn the powerful information and experience TAG TEAM Marketing's training. TAG TEAM Marketing began promoting Black businesses at the seminars. Business owners were able to spotlight their products and services, sell their their goods and receive support from the audiences that attended the seminars. Several business owners became so successful as a result, that they traveled all over the United States to each seminar that TAG TEAM Marketing held. 2001 also saw the launch of www.BlackBusinessSeminar.com, the official Black Business Seminar website. The impressive website reached thousands of people all over the world and was instrumental in 70% of seminar sales. TAG TEAM also published its first Black Business Seminar full color newsletter which highlighted the success of the seminars. In addition, the P.O.W.E.R. Circle, led by Deborah Wilson de Briano, published a vegetarian cookbook entitled "Wow! I Can't Believe This Is Vegetarian Food!". It was an exciting year! In 2002, TAG TEAM Marketing took the Black Business Seminars to another level, holding multiple events all over the country. In March, TAG TEAM hosted a very successful series of Black Business Seminars called "Taking your Dreams to the Next Level". The tour took TAG TEAM to Detroit, Michigan for first time, as well as Los Angeles, New York and Washington DC. In July-August TAG TEAM hosted the "Marketing Your Million Dollar Idea" tour that took TAG TEAM to Houston, Texas for the first time, as well as Los Angeles, New York City and Washington, DC. In November, the seminar tour went back to Washington DC and New York City. The Black Business Seminars were nothing short of spectacular. 2002 also saw the release of TAG TEAM Marketing's new "V.I.P. Network" online community (which expanded on the original Underground Forum) as well as the "Producer's Playground" where TAG TEAM members could work their businesses online. These state of the art information systems greatly enhanced TAG TEAM Marketing's productivity. In this year, TAG TEAM Marketing President Delxino Wilson de Briano was presented with two letters of special recognition for the work he was doing in the Black community, from the United States Congress. In 2002, TAG TEAM Marketing touched the lives of thousands. In 2003, TAG TEAM members promoted Black Business Seminars all over the east coast including the state of Connecticut for the first time. Several superstar TAG TEAM Marketers emerged and many earned leadership positions. TAG TEAM's classic Black Business Seminar Promotional Video "X" was released and helped take seminar promotion to another level. TAG TEAM Marketing released a new version of the TAG TEAM website in 2003 with a new and improved TAG TEAM Network online community (formerly called the V.I.P. Network). The community featured major enhancements including a member to member internal online mail system, sales reports and graphs, downline reports for members and more. Also, a special section was added to the website for Team Leaders, called the "Team Leaders Lab". In 2003, TAG TEAM Marketing President Delxino Wilson de Briano released his first ever TAG TEAM audio training series, called Leadership For Black People. 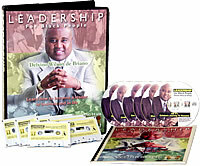 The recordings teach Black people how to become leaders in business and in life. The audio series became an immediate best seller internationally. 2004 was a year of expansion and change for TAG TEAM Marketing. TAG TEAM members promoted Black Business Seminars on the East Coast, Midwest and in Atlanta, Georgia for the first time. Also, TAG TEAM hosted its first specialized Black Business Seminar for members of another network marketing company. All of the events were great successes. Major enhancements were made to the TAG TEAM website which received an entirely new look, and lots of new functionality, including a video arcade, a new TAG TEAM Store, new functions for members, and more. Thousands more joined the TAG TEAM Network and the message of TAG TEAM continued to spread. Then, on TAG TEAM Marketing's 10th birthday (August 29, 2004), Delxino and Debbie Wilson de Briano founded TAG TEAM Marketing International, Inc., a full-scale network marketing company complete with it's own products and services for sale, and business opportunity. The new company had a powerful new income structure, enhanced online training system and more. Delxino and Debbie also introduced TAG TEAM's new cellular phone program TAG TEAM Wireless and TAG TEAM Long Distance phone service. With hundreds of new subscribers signed up in 2004, TAG TEAM Wireless and TAG TEAM Long Distance both got off to an incredible start. On January 1st, 2005, TAG TEAM Marketing's founders Delxino and Debbie Wilson de Briano announced a new compensation plan complete with 7 ways to earn income. With the addition of "Monthly Residual Bonuses", the new TAG TEAM Compensation Plan paid out more than any similar company in the network marketing industry. On May 1st, TAG TEAM launched Voice Over I.P. (Internet Phone Calling Service) called TAG TEAM iTalk. This new phone service revolutionized the way people use the telephone. 2005 was also a great year of establishing the new opportunity. Tons of meetings were held, new distributors joined, products were sold, commissions were earned and success was achieved. TAG TEAM President Delxino and Debbie also started implementing plans for a future project. For years, they had dreamed of creating a massive marketing project that would tie Black businesses together with Black consumers all over the world. They dreamed of marketing the products and services of Black-owned businesses through TAG TEAM Marketing. The time for that grand project was nearing. But there was much ground work that needed to be done. First, they needed to unify Black business owners. In November 2005, TAG TEAM began hosting its legendary, weekly Black Business Networking events, where Black business people met to do business with other Black people. These events became an instant sensation. Also, Black Business Seminars were held all over the country. Lastly, TAG TEAM Marketing began construction on a new headquarter facility that would house the project. In 2006, TAG TEAM opened the Atlanta TAG TEAM Marketing Center, a 14,000 square foot facility that became the new headquarters for TAG TEAM Marketing's activities. The facility is equipped with specialized rooms and equipment that makes ideal Black business training and production possible. Furthermore, events held there can be automatically broadcast live over the Internet. Hundreds of events were held at the Atlanta, Georgia facility in its first year. TAG TEAM held a series of Black Business seminars at the new facility for Black businesspeople. Some were seen all all over the world through TAG TEAM's Live Internet Broadcast. TAG TEAM also began releasing the popular Master Marketer Collection CDs, which are a series of recorded educational and motivational lectures by top TAG TEAM leaders who have earned the top position in TAG TEAM Marketing, called Master Marketer. TAG TEAM also found the first product that it would market for another Black-owned business. TAG TEAM members began selling Ebony Secret Miracle Skin Conditioner, which is an incredible product that has amazing results on Black skin. TAG TEAM members sold the product to Black consumers all over the world, moving over 1,000 bottles in the first month alone. 2006 sales of the exciting, new product were enormous. Also, weekly TAG TEAM Networking events in Atlanta, Georgia became a staple in the Atlanta Black community. Thousands of Black people attended the events. The events became the place where Black business owners could come each week, promote and sell their products to other Black people. Hundreds of thousands of dollars in Black-on-Black commerce were generated at these events in 2006. In 2007, TAG TEAM Marketing took a major step towards its goal of marketing Black products for Black-owned businesses to Black consumers. TAG TEAM retired the TAG TEAM Network online community and TAG TEAM telecommunications services, and launched the new Black Business Network as its main program. TAG TEAM held tons of events to promote the new Black Business Network and service their members. In 2007, TAG TEAM held hundreds of Black Business Networking events, Black Business Seminars, international conference calls, TAG TEAM University classes, presentations, production events, shopping events, parties and celebrations, in various cities in the United States. TAG TEAM started pulling together Black business owners, training them, and promoting their businesses like never before. The Black Business Network was an instant hit. The new website, www.buyblackmovement.com, was visited by people all over the world. In a little over 9 months, over 6,000 Black people joined the Black Business Network, from 35 countries. Business members promoted their products and services online, and sold them at the live events. Almost every professional member of the Black Business Network earned hundreds of dollars, some earned thousands of dollars and several earned tens of thousands of dollars as a result of their memberships. One member even earned half a million. (1) Black business owners joined the Black Business Network and offered their products for sale in TAG TEAM's new Buy Black Today online and retail stores. (2) Black people joined the new TAG TEAM Business Opportunity where they went to work getting Black people to purchase products from the Buy Black Today store. (3) Black consumers purchased the products from the online store. Together, these programs began creating great Black wealth. For the first time. TAG TEAM Marketing distributors were able to sell the products and services of Black-owned businesses. Now, Black-owned businesses could have their own network marketing sales-force promote and sell their products and services for them, without having to build a sales force on their own. In 2009, TAG TEAM Marketing made huge strides towards it goals. TAG TEAM Marketing began broadcasting events live over the Internet regularly during this year, and gained huge audiences all over the world. Several new, powerful videos were produced that year, including the powerful "Amazing" promotional video, that touched the hearts of Black people all over the world. Several major Black-owned businesses joined the Black Business Network and began utilizing TAG TEAM Marketing to promote their businesses. The Black Business Network program was enhanced. It became both a state of the art online community (social network) and business building tool. The new program and website officially launched on August 29th of that year, and immediately attracted new members in the thousands. Over 1,000 new members per month began joining the program. By the end of the year, over 29,000 new members had joined the organization, from 90 countries around the world. Thousands of products from Black-owned businesses were sold by Black TAG TEAM distributors to Black consumers during 2009. TAG TEAM Marketing was on it's way to becoming a major force in the distribution of Black products and services. 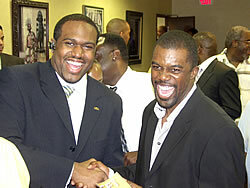 In 2010, the Black Business Network program firmly established itself in Black distribution. Thousands of Black-made products were sold by Black distributors for Black-owned businesses to Black consumers, bringing great wealth to the Black community. This year, TAG TEAM Marketing distributed significant quantities, not only of products, but of Black-provided services as well, for the first time. TAG TEAM developed several new programs to accommodate several service-based businesses, and generated tens of thousands of dollars in sales for those companies. TAG TEAM Marketing held events and speaking tours all over the United States, promoting the Black Business Network movement. New members joined the movement in many new areas, bringing the community-changing work of TAG TEAM Marketing to new fronts. TAG TEAM Marketing broadcasted hundreds of events all over the world via the Internet, reaching countless Black people all over the world. Delxino Wilson de Briano, President of TAG TEAM Marketing, spoke at several major Black conferences, delivering his powerful message of Black economic unity and promoting the Black Business Network to thousands of Black people. Delxino also received several major awards from Black organizations for his work in empowering the Black community. In late November, TAG TEAM Marketing announced a major enhancement to compensation plan of the TAG TEAM Marketing Business Opportunity, making it the most profitable business opportunity available. The TAG TEAM Marketing business opportunity was officially named "Black Star", in honor of Marcus Garvey's great program, the Black Star line of the early 1900s. TAG TEAM Marketing began preparing for the major promotion of the new TAG TEAM "Black Star" Business Opportunity which would begin in January, 2011. In preparation, the first "Black Star Promotional Video" was released in December, 2010. The video features several great speakers and leaders in the modern Black era, all echoing the sentiments of the Black Business Network. In 2011, TAG TEAM Marketing released version 5.0 of the Black Business Network website which combined all of TAG TEAM's products, services programs into one website. The new website featured a new, simpler design and made buying, selling and promoting the products and services of Black-owned businesses easier for all. The membership of the Black Business Network expanded greatly, reaching over 39,000 members in 113 countries around the world. In 2011, Black Business Network members participated in hundreds of discussions, live presentations, online broadcasts and conference calls. Marketers in the Black Star Opportunity held presentations, meetings and events in many parts of the United States. 2011 also saw the introduction of the amazing nutritional product Motherland's Gold Moringa, which quickly broke sales records and became the fastest selling product in TAG TEAM Marketing history. The product delivered outstanding health and wellness improvements to Black Business Network members who used it, which led to the amazing sales of the product. Thousands purchased products and services from Black-owned businesses in the Black Business Network in 2011, which led to TAG TEAM Marketing achieving a ground-breaking milestone; 39,000 products and services sold, matching the 39,000 members of the network. That means that on average, every single member of the Black Business Network who signed up (for free), purchased at least one product or service from a Black-owned business in the program. This 1 to 1 member to sales ratio has rarely (if ever) been achieved by an organization when offering free membership to the public, with membership in the tens of thousands. This achievement clearly showed that the TAG TEAM Marketing was reaching its goals, making buying Black a reality for tens of thousands of Black people, bringing much needed revenue to Black-owned businesses, and making a major impact in the Black community. In 2012, TAG TEAM Marketing reached great milestones with the Black Business Network program. The membership grew to over 43,000 members in 124 countries around the world. Members participated in hundreds of events, conference calls, training events, seminars, networking events, presentations and the like. The purpose of the Black Business Network was spread during 2012, like never before. Major presentations	were	held	in	many	cities	including	Los	Angeles,	San	Diego,	Fort	Lauderdale,	West	Palm	Beach,	Chicago and Atlanta. TAG TEAM Marketing hosted several powerful bootcamps this year; Recruiting Bootcamp for Network Marketing distributors, as well as bootcamps for aspiring Speakers & Authors. They were attended and raved about by Black people from all over the world. Motherland's Gold Moringa soared to new heights in the Black Business Network during in 2012, becoming the #1 selling product for the year. Countless customers reported miraculous health improvements using the product, which spurred record sales. In all, it was a banner year, where TAG TEAM Marketing reached new heights. 2013 was a year of massive progress towards the goals of TAG TEAM Marketing. In April, the company surpassed 50,000 product sales, a huge milestone in business, and an even bigger milestone for a Black company selling Black-made products and services to Black consumers. In August, the co-founders of TAG TEAM Marketing announced and implemented major changes that made the Black Business Network much more powerful and effective; They retired all of the non-productive and non-essential programs from the Black Business Network, and focused the entire movement's efforts on the core programs that were actually accomplishing the goal of the network (getting millions of Black people buying from Black-owned businesses, consistently). The Supplier, Marketer and Consumer programs received huge boosts and enhancements. At the same time, TAG TEAM Marketing launched its powerful Supporter Program, which rewards Black consumers for committing to purchase products from Black-owned businesses in the Black Business Network, on a monthly basis. The program was an instant sensation and attracted committed brothers and sisters from all around the United States, while sending the movement's sales through the roof. In 2014, the Black Business Network continued to expand rapidly all over the world. In April 2014, TAG TEAM Marketing President Delxino Wilson de Briano delivered a groundbreaking presentation about the life and work of Marcus Garvey. The overwhelming response to this presentation led to the publication of a 4-DVD set about Marcus Garvey, followed by a speaking tour that spanned the United States and included cities like Atlanta Georgia, New York City, Los Angeles California, Champaign Illinois, Detroit Michigan, Fort Lauderdale Florida, San Diego California and Little Rock, Arkansas. Audiences everywhere got to learn about the great Marcus Garvey, who inspired TAG TEAM Marketing and the Black Business Network. Since most of the events were broadcast live on the Black Business Network website, countless more watched these presentations around the world, from the comfort of their own homes. At the August 2014 annual convention, the letters "TAG TEAM" were official changed to mean "The Afrikan Group - Together Everyone Achieves More"
The Black Business Network continued to grown and expand in all directions. Most importantly, the entire Marketer team prepared for, what they knew would be, a history making year in 2015. The year 2014 closed at an all time-high in product and sales of Black-made products, with the biggest grossing holiday season to date. In January of 2015, TAG TEAM Marketing launched the historic "Buy Black Movement", an initiative to get Black people buying from Black-owned businesses in the Black Business Network, consistently. The movement garnered immediate support from all over the world, getting Black people committing to becoming monthly purchasers of Black-made products. Delxino and Debbie delivered live presentations related to the Buy Black Movement every weekend during the year and broadcast each event live for viewers all over the world to see. These included historic presentations like "The Trillion Dollar Game" and "Successful Movements in Black History". They delivered most of the presentations in Atlanta, Georgia, but they also traveled to other cities including Los Angeles California, San Diego California, New York City, Salisbury Maryland, Tuskegee Alabama and more. TAG TEAM Marketers heavily promoted the new program sold many thousands of Black made products. 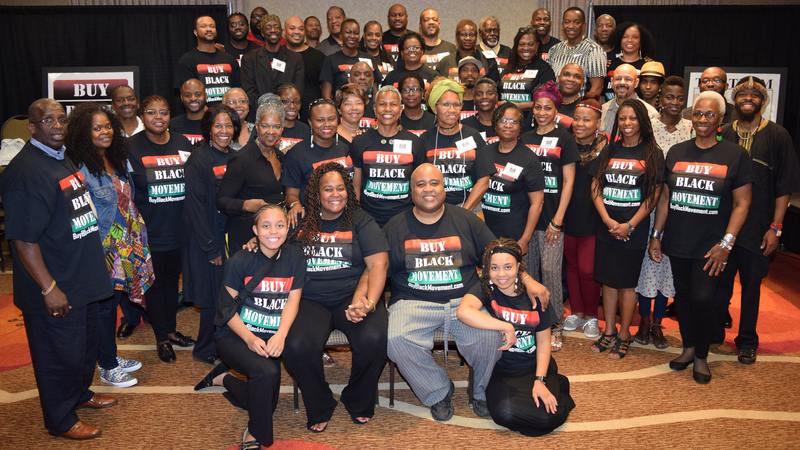 By the end of the year, the Buy Black Movement was firmly established as a powerful program addressing the current economic needs of the Black community. 2016 was a year of incredible production and growth. Every single statistic in TAG TEAM Marketing started going up at rates faster than ever before. Most significantly, more Black people joined and started purchasing products and services than ever before, leading to all-time high revenues for Black-owned businesses and Marketers involved in the movement. One particilar Marketer, Dorothy Cooper of Los Angeles, California, broke all previous records for personal production by achieving Platinum status (1,000 points in sales or more) FIVE MONTHS out of the year. Furthermore, she achieved DOUBLE Platinum twice in the year, becoming the first person in the history of TAG TEAM Marketing International to do so. TAG TEAM Marketing released its greatly improved Supporter Program (2.0) this year, which added status titles and rewards dollars for purchases, as well as rewards for the purchases of others one referred to the program. These enhancements were raved about by members everywhere. TAG TEAM Marketing also officially transitioned away from the term 'Black Business Network' referring to the entire movement, and instead applied the term to refer to the Supplier program. The overall movement, started being called the "Buy Black Movement". The new Buy Black Movement consisted of three main programs: (1) The Black Business Network - for business owners to supply products, (2) TAG TEAM Marketing Opportunity - for Marketers to sell the products and (3) Supporter Program - for committed Black consumers to buy the products. With this change, the purpose of the movement became much more self-explanatory. As a result, the Buy Black Movement expanded at an even higher rate. In November, TAG TEAM Marketing launched the BuyBlackMovement.com website, and officially retired www.buyblackmovement.com. The new website is visually stunning and full of enhancements and instantly became a hit, as well as the proud, new, online home for the Buy Black Movement and its programs. 2017 was a year of record-setting sales, growth and success. Suppliers provided first-rate products to be sold and delivered world-wide. Marketers promoted the Black-made products to Black consumers and made impressive sales. TAG TEAM Marketing mailed out tons of commission checks to Marketers and Suppliers around the world. By the end of the year, the amount of commissions dollars paid had increased by a whopping 124% when compared to a year earlier (2016)! TAG TEAM Marketing also issued its first Supporter Rewards checks in 2017. 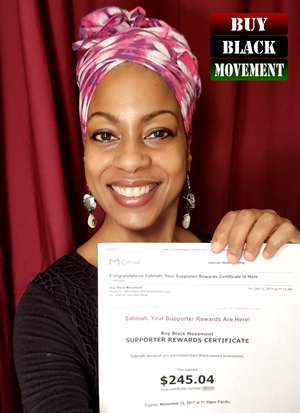 Thousands of dollars in rewards cash was issued to Supporters around the world who had accumulated rewards dollars by buying products and services from the Buy Black Movement each month. Using their rewards dollars, Supporters purchased merchandise from Black-owned businesses for free. Supporters everywhere were thrilled by the exciting feature. Furthermore, TAG TEAM Marketing held a historic Annual Convention in Atlanta, Georgia that brought together the most committed members of the movement from around the world. The convention was phenomenal and set the stage for future expansion of the Buy Black Movement. 2018 is now underway. This is an incredible time to be involved in TAG TEAM Marketing. The TAG TEAM Marketing vision is quickly becoming a reality. As Delxino said years ago, "The Underground Railroad of the 21st century is the mass distribution of Black-made products and services". Now, the train is moving. In time, it will deliver the Black community to economic power. Get involved in the Buy Black Movement. Become a Supporter, Marketer or Supplier today and become a part of TAG TEAM Marketing history. Hear young Delxino Wilson de Briano at age 26, speaking to a room full of TAG TEAM Leaders in 1996. This TAG TEAM "EFT Ball" was held in Atlanta, Georgia for members who had earned the first leadership position in the opportunity. This classic video shows TAG TEAM Marketing of the 1990s in all of its splendor. Watch members doing business, having fun, training, bonding, dancing and more. This video will inspire you. Follow TAG TEAM on the road to success, to a land where you have never been before. This is the first convention promotional video ever made by TAG TEAM. This classic video promotes the then upcoming October 1997 TAG TEAM National Convention in Atlanta, Georgia. See what life is like BEFORE finding TAG TEAM Marketing. Then, see the whole other world of TAG TEAM Marketing like you've never seen it before. Watch this exciting video that celebrates Black Achievement. This video puts TAG TEAM Marketing into historic perspective by showing many of the strides Black people have made in history. This video will motivate you and make you proud, like none other. This 45 minute video follows TAG TEAM through its October 1997 TAG TEAM National Convention in Atlanta, Georgia. Experience the energy. Hear all of the speakers. Watch the first ever TAG Awards Show. Experience TAG TEAM of the 1990's in all of its splendor. This classic, timeless video will show you the heights that young, Black, fearless network marketers can reach. It will move you like nothing else you've ever seen. This classic TAG TEAM video promotes the then upcoming March 1998 TAG TEAM Convention in San Diego, California. This video follows the story of the 1997 Atlanta Convention Promo video, showing life AFTER finding TAG TEAM Marketing. See TAG TEAM California members party California style in this classic video. TAG TEAM Washington DC (Team DC) won TAG TEAM's prestigious Team of the Quarter award for the 4th Quarter of 1997. As a result, the leaders of the team were awarded with their very own highlight video live on stage during TAG TEAM's March, 1998 San Diego National Convention. The classic video shows TAG TEAM Washington DC members in action at TAG TEAM national conventions and demonstrates the pride, unity and power of the team. This classic TAG TEAM video, released in 1998, shows the many faces and smiles of TAG TEAM Marketing. The video was made for members of TAG TEAM, in order to remind them that THEY are the biggest inspiration of the organization. The video includes incredible scenes of the Black unity filmed at TAG TEAM National conventions. This classic TAG TEAM video promoted the then upcoming July 1998 TAG TEAM Convention in Secaucus, New Jersey. Watch TAG TEAM members learning, training and enjoying TAG TEAM conventions. Watch the classic 'this or that' comparison of TAG TEAM vs. everyday life. An absolute classic! TAG TEAM California won TAG TEAM's prestigious Team of the Quarter award for the 1st Quarter of 1998. As a result, the team was awarded with their own highlight video. This light-hearted, humorous video captures the fun essence of that magical California team that became number one in the world for their legendary sales production.This video features outtakes from the various TAG TEAM videos and performances California team members starred in. This classic TAG TEAM video opens with stunning Black history visuals, showing that TAG TEAM is here to "do it again". The video goes onto show the awesome TAG TEAM network marketing organization of that time in action at the Secaucus 1998 TAG TEAM National Convention. This video is full of energy and member testimonials and will get your heart thumping. This classic video promotes the then upcoming Norfolk 2000 TAG TEAM Convention. See each of the members of TAG TEAM's leadership team from the year 2000. Then preview all of the excitement, fun and activities and training that will be delivered at the then upcoming TAG TEAM convention. See world-famous rapper Doug E. Fresh promote the convention wearing a TAG TEAM T-shirt and hat. This video promotes the then upcoming November 2001 Black Business Seminar Tour. TAG TEAM President Delxino Wilson de Briano personally speaks on this video, promoting the Black Business Seminars. See images and hear testimonials from the previous Black Business Seminar. Hear Delxino interviewed by celebrity radio host Steve Harvey. This video promotes TAG TEAM's powerful Black Business Seminars. Watch lots of seminar attendees give their feedback about the training they received from TAG TEAM President Delxino Wilson de Briano. Learn all about Delxino and what the Black Business Seminars deliver. Get ready because 'X is gonna give it to you'. Hear about the Black Business Network project and future plans, and get a historical perspective on the message of buying Black. Can You Help Build The Black Business Network? Watch this presentation by TAG TEAM President Delxino and Vice President Deborah Wilson de Briano, asking you to help build the Black Business Network. Delxino explains what the Black Business Network is and exactly what you can do to help it grow. Watch the exciting promotional video for the TAG TEAM Recruiting Bootcamp weekend seminar. Hear powerful success stories from others who have attended this powerful training event. Watch this exciting promotional video about TAG TEAM Marketing's phenomenal Black Star Business Opportunity. Watch this exciting excerpt of a speech by Delxino Wilson de Briano. Learn important truths about buying Black. Watch this powerful, 3-minute promotional video for the upcoming TAG TEAM Marketing Annual Convention in Atlanta, Georgia. Hear TAG TEAM Marketing President Delxino Wilson de Briano talk about the importance of having dreams and the TAG TEAM Marketing 'Black Star' Opportunity. Get inspired! Watch this video. Hear TAG TEAM Marketing President Delxino Wilson de Briano speak about Leadership. This powerful, 6-minute promotional video promotes the then upcoming August, 2017 TAG TEAM Marketing Annual Convention in Atlanta, Georgia. This is the first convention promotional video that promotes the Buy Black Movement program. A classic!